The JVS-PAC is a small device that enables you to play MAME on your JVS cabinet with a minimum of hassle. JVS-PAC is not a business - this is purely hobby project, they are literarily made on my coffee table..
JVS, or Jamma Video Standard (sometimes even called JAMMA 2), is a specification by a JAMMA special sub-committee consisting of the major arcade game manufacturers. 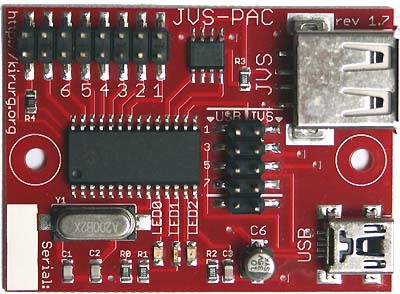 The JVS-PAC behaves like a JVS game to the I/O controller, and a USB keyboard to the computer it is connected. The keyboard output is mapped to standard M.A.M.E keys.